Brand: Lorann Oils and Flavors L-0750 Units: 4 fl. oz. jar When it comes to flavoring, professional bakers almost exclusively use emulsions over extracts. Why? Because emulsions have a more potent, robust flavor, that won't "bake-out" when exposed to heat. They are water-based. 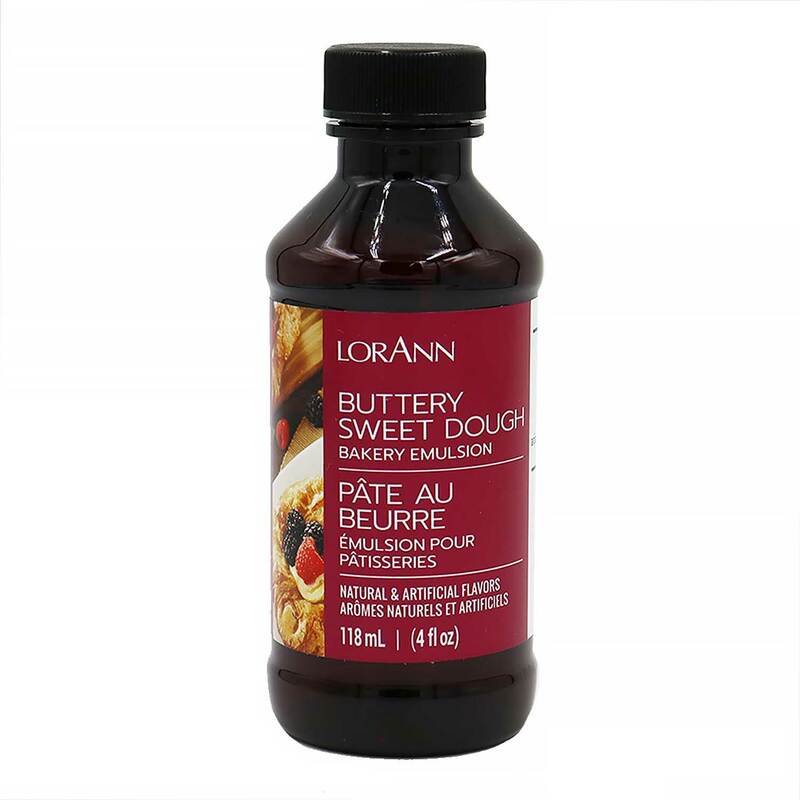 LorAnn's emulsions are characterized by a rich long-lasting taste that is bursting with aroma and flavor. An excellent choice for flavoring all of your homemade baked goods, including cookies, cakes, sweet breads and pastries as well as frostings, glazes, fondants, fillings, cream centers and other confectionary items. Natural and artificial flavorings. The rich taste of creamery butter combined with a hint of citrus and vanilla that will give your homemade sweet breads and pastries an irresistible flavor. It's also delicious in pancake batter and French toast! Could be the secret ingredient in all your homemade treats. Use 1 1/2 to 3 teaspoons of this flavoring per 3 cups flour in sweet dough, cake or cookie recipes. Emulsion is sugar and gluten free. When it comes to flavoring, professional bakers almost exclusively use emulsions over extracts. Why? Because emulsions have a more potent, robust flavor, that won't "bake-out" when exposed to heat. They are water-based. LorAnn's emulsions are characterized by a rich long-lasting taste that is bursting with aroma and flavor. An excellent choice for flavoring all of your homemade baked goods, including cookies, cakes, sweet breads and pastries as well as frostings, glazes, fondants, fillings, cream centers and other confectionary items. Natural and artificial flavorings. The rich taste of creamery butter combined with a hint of citrus and vanilla that will give your homemade sweet breads and pastries an irresistible flavor. It's also delicious in pancake batter and French toast! Could be the secret ingredient in all your homemade treats. Use 1 1/2 to 3 teaspoons of this flavoring per 3 cups flour in sweet dough, cake or cookie recipes. Emulsion is sugar and gluten free. Ingredients: Water, Propylene Glycol, Natural and Artificial Flavors, Xanthan Gum, Natural Color.